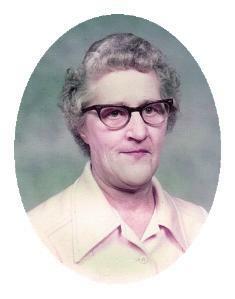 Elaine E. Bossler, 86, formerly of Chiswell Street, Saukville, WI died Thursday, April 29, 2010 at Heritage Nursing and Rehabilitation Center, Port Washington where she had been a resident of recent weeks. She was born in Milwaukee on April 19, 1924, daughter of Erwin and Susan Laubach Brandt. She moved to Saukville as a child, attending local school and graduating from Port Washington High School. On July 7, 1944, she married Edward A. Bossler of Port Washington at Immaculate Conception Church in Saukville. Ed was a fisherman with the former Bossler Bros. of Port Washington for many years and a material handler with Simplicity Manufacturing. He preceded her in death on May 25, 1982. Over the years she worked as a cook with the Ozaukee County Sheriff’s Department, Smith Bros. Restaurant and Immaculate Conception Catholic School. She enjoyed reading and local history. She was avid in scrapbooking long before it became popular. She collected salt and pepper shakers and always took time to watch her favorite cooking shows. She is survived by her children Dale (Patricia) Bossler of Oostburg; Dennis (Sharon) Bossler of Hingham, Barbara (the late Vince) Marciel of Saukville and Bonnie (Gordon) Esselmann of Port Washington, 16 grandchildren, 25 great-grandchildren, other relatives and friends. She is preceded in death by her husband, sisters Armella Oosterhaus and Mildred Kurtz and an infant son Aloysius. Funeral services will be held at 6:30PM Wednesday May 5, 2010 at the funeral home. Reverend Thomas Lijewski of Immaculate Conception Church, Saukville and Dr. Paul Thyren of Grace Bible Church of Adell will officiate. A visitation will be held after 4PM Wed. until services at the funeral home. Interment will take place at St. Mary’s Catholic Cemetery in Saukville.